Against my better judgement I switched on the BBC iPlayer yesterday to look at the Olympic Opening Ceremony. I found it difficult to pause it and get on with some work. Eventually I watched the whole lot, excluding the march past from about Azerbaijan to Venezuela. All of the things I was going to say about it have already become clichés in the coverage of the mainstream media (crazy, bizarre, mental, bonkers, very British etc.) 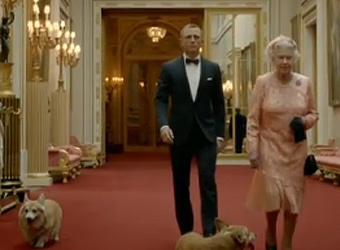 The sketch with James Bond and the Queen was priceless. Having checked today, I am impressed that Her Majesty herself delivered the line "Good evening Mr Bond": to join in with such an irreverent send-up is, I would suggest, a mark of humility. The show contained some stunning redundancy. Sir Simon Rattle, principal conductor of arguably the best orchestra in the world, the Berlin Philharmonic, had the London Symphony Orchestra rendering the Chariots of Fire theme - but all as a backdrop to a Mr Bean sketch. The weird celebration of the NHS could be taken as a joke in itself and possibly was meant as such: it's hard to say. After all, the GOSH nurses were dressed up in old fashioned nursing outfits and the scene morphed into Peter Pan, Harry Potter and Mary Poppins. My grumpiness melted away further after Mass. Every youngster in the parish that I spoke to seemed to have tickets to several events. Two girls had tickets for prime seats for half a dozen venues because they are doing PE at GCSE. I'm really glad about that.